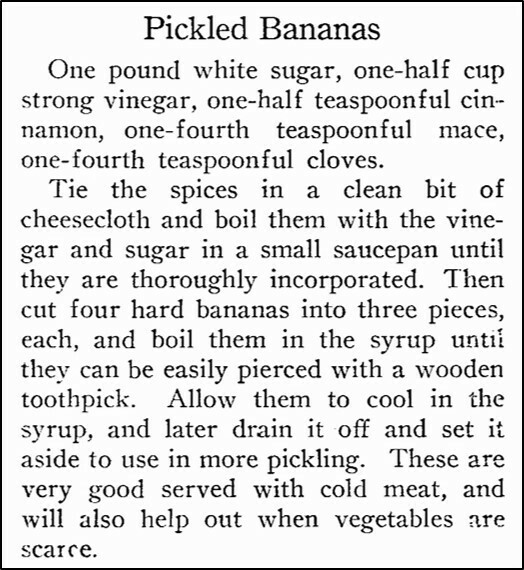 I’ve pickled lots of different fruits and vegetables, so when I saw a recipe in a hundred-year-old magazine for Pickled Bananas I just had to give it a try. The Pickled Bananas were a nice change of pace. The pickling syrup which contained cinnamon, mace, and cloves was delightful. And, much to my surprise, the pickled bananas reminded me a little of pickled beets or other pickled starchy vegetable. Put sugar and vinegar in a saucepan, stir. Then tie the spices into a small bag made of cheesecloth, and place in the saucepan with the sugar and vinegar mixture. (A small amount of the spices will leak out of the bag into the syrup – that’s okay). Bring the mixture to a boil using medium heat, then add the banana pieces. Bring the liquid back up to a boil, and then reduce to simmer. 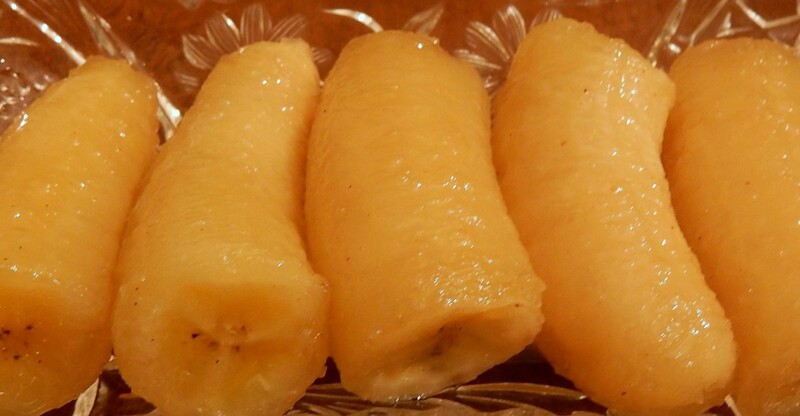 Cook until the bananas are tender and can be easily pierced using a wood toothpick. (The length of time will vary greatly depending upon how hard the bananas are. It might take 10 minutes, or it may take 30 minutes or more. Be patient.). Remove from heat. Chill for eat least 4 hours before serving. Remove from syrup and serve. I am not as frugal as homemakers a hundred years ago. I did not set the syrup aside for more pickling after I made this recipe. Posted on March 18, 2018 March 21, 2018 by SherylPosted in FoodTagged banana, recipe. As Grandma would say, “Well, I never!” Of all the things I could have imagined, pickled bananas never would have been on the list. We often had pickled crabapples, pears, and peaches when I was a kid, so why not? I had to look at the recipe a second time, and then I saw that it calls for green bananas. That makes sense, and helps to explain why they wouldn’t turn to mush. I like bananas foster, so I might try this as an alternative. I had a similar reaction when I first saw this recipe. Pickled bananas are not my favorite pickled fruit, but they provide some nice variety. “I did not set the syrup aside for more pickling”—quote of the week! 🙂 Neither did I when made this recipe. People were so frugal back then. Never heard of pickled bananas. Such an interesting idea! It’s amazing how many different foods can be pickled. I think that you’ll have fun trying this recipe. Now this is fascinating. I would really like to try these. But it sounds like a lot of work if I don’t like them. Please come make them for me :). 🙂 Wish that I could share food virtually. I would be first in line! There is definitely a psychological component to food preferences as food fads come and go. Wow! I’d love to taste one, but I’m too busy staying out of the kitchen to try it. These sound good to me. I’ve had fried plantains as a side to meat, so why not pickled bananas? Very interesting. In some ways this recipe reminded me of plantains – though obviously there are differences. I find it fascinating that the recipe author encouraged people to reuse the pickling juice. People were so frugal and focused on saving a hundred-years-ago. This looks surprisingly good! Who knew?! Since bananas have a relatively mild flavor they take on the sweet/sour flavor of the pickling syrup nicely.